Since we know everyone might not know what Aquaponics is here is quick description. Aquaponics is the combination of aquaculture (raising fish) and hydroponics (raising plants with nutrient water). It is a combined system that uses the mutual benefits from both environments. Aquaponics uses one tenth or 10% of the water used in traditional farming methods and requires no chemicals. 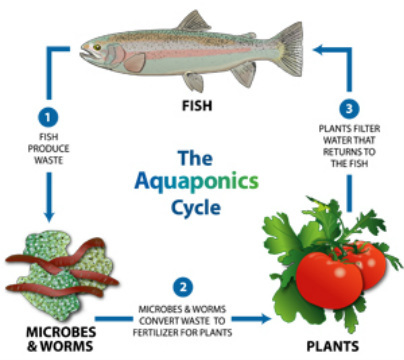 Instead of chemical fertilizers or nutrient mixes (like in hydroponics), aquaponics utilizes the natural fertilizer of fish waste. Using naturally occurring nitrifiying bacteria, the fish waste, which is largely ammonia, is converted to nitrites and then to nitrates. Red worms are also added to certain grow beds and convert any solid wastes or left over plant matter into vermi-compost. This creates a bio-filter system. The water is pumped to the grow beds for the plants and acts as a nutrient solution, or natural fertilizer. The only external input to these systems is the fish food. In many cases the fish food can be grown as duckweed or fingerlings. These systems consist of one single continuous cycling unit. Once these systems are tuned in, nutrient and pH levels balanced, the water is crystal clear. The bio-filter is a small ecosystem and maintains itself. To make up for water loss through evaporation and transpiration to the vegetables, a small amount of water is added weekly. There is minimal usage of water compared to traditional farming which is good for the environment and the farmer. Aquaponics system are also extremely flexible and customizable. In a greenhouse environment they are entirely climate neutral systems, meaning they can be built anywhere in the world. 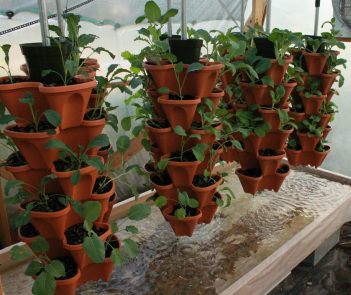 Depending on the type of produce to be grown, aquaponics systems can be configured in a variety of arrays. We will be utilizing vertical farming systems for low growing produce like lettuce, spinach, strawberries and a variety of herbs. Vertical farms allow aquaponics to produce at extremely efficient rates. On just 6000 sq ft a some vertical systems can produce the same amount of lettuce as a 16 acre farm in California. Though not every farmer can afford these large elaborate facilities. We aim to find a common ground that is both highly productive and cost efficient. In one design, our 30' x 96' facilities are able to produce up to 7200 heads of lettuce a month, on just 2880 sq ft.. Our system is designed to incorporate vertical farming techniques, natural and artificial light, and optional floating rafts. Certain crops require a bit more clearance and support, like tomatoes, cucumbers, melons, peas, and pole beans to name a few. Since aquaponics delivers the nutrients straight to the roots its easy to let climbers like these go crazy on a trellis system. The roots are contained in trays with controlled water flow so each type of plant can receive the appropriate watering conditions. Fresh raised fish year round. With all this talk about plants you’re probably wondering by now, where do the fish fit in? Great question. With our year round harvest schedule for organic produce we are also able to offer year round fresh fish. 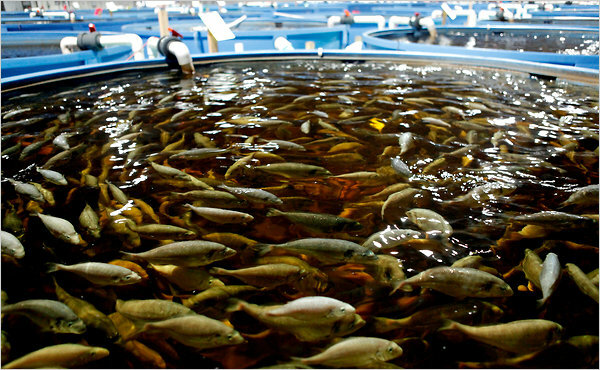 Utilizing a staggered tank system we are able to harvest fresh Talapia every week. The fish are completely organically raised and can be cleaner than fish pulled out of the ocean since they are raised in a controlled micro environment. We are using Talapia in our systems due to the fast harvest time but an array of fish can be raised including but not limited to: Blue Gill, Catfish, Crawdads, Large Mouth Bass, Shrimp, Trout, Sunfish, Carp, Barramundi, Silver and Gold Perch, Pacu and Salmon.